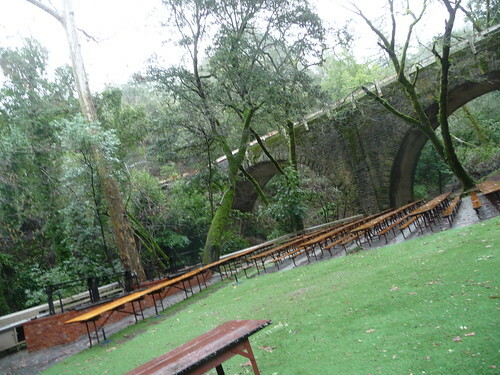 Mali Mish – A Rainy Saratoga. Just a week before we set out on a cross country trip, we headed up the opposite direction towards northern California for a shakedown trip and to visit my mom and brother one last time. This is how our girls look in the back of the van all packed in. 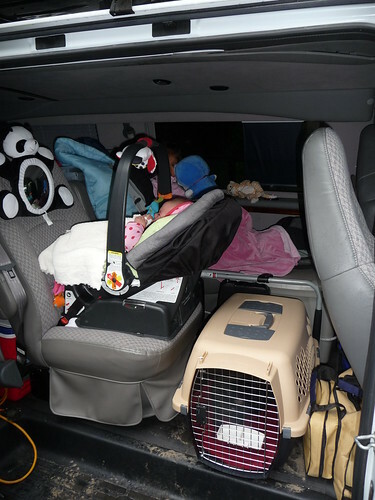 As usual, we chose to drive after their bed time so they can sleep in the van during the long haul. It is a good 300 miles from our house so we had close to 6 hours of road ahead of us. 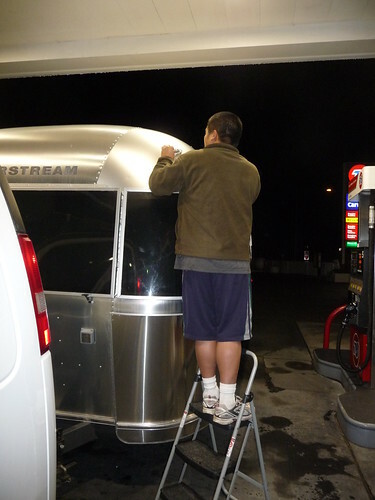 About 30 miles down the road, we are already seeing our first problems with the Airstream. It’s not a big deal but we had a bad running light on the left side of the trailer. Didn’t look like a bad bulb as it would blink on and off with a jiggle of the hand. Probably a loose connection or a rain related shortage of some kind. Another thing to put on the list. The plan was to make it to Camping World in San Martin, CA. It is only about 20 minutes from my brother’s place in Campbell, CA and it provides us with a nice, safe place to pull over, park and catch some Zs ’til the morning. 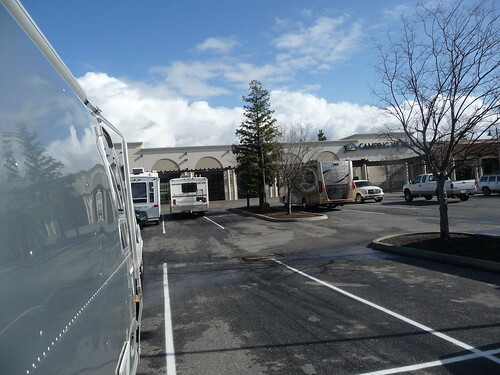 As we pulled into a lot full of RVs and shuttled everyone into the trailer, another problem with the Airstream immediately was apparent. The furnace has stopped working. I figured that we had just emptied another propane tank but even after we switched to the fresh tank, the furnace still did not want to kick on. Since it was already 4am at this point, we decided to just bundle up and sleep through the rest of the night in the cold trailer. By the morning, we gave the ol’ furnace another shot and this time, for no apparent reason, it just kicked on. Well, I guess that’s why we have warranty. Add another item to the list. Uncle Eric met us as we pulled into town and showed us a little secret spot for us to park the Airstream for the day before finding a camp site. It’s just a short walk from a decent dim sum restaurant. 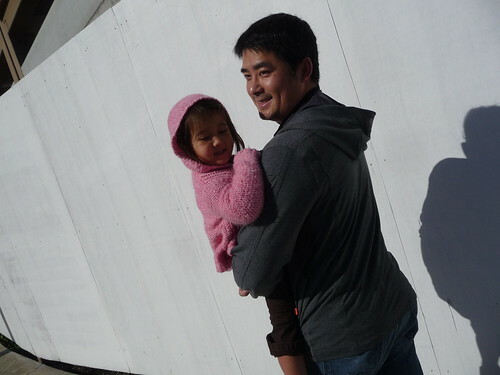 Well, short if you are not carrying a 35 lb toddler in your arms the entire way. He actually didn’t seem to mind as he doesn’t get to see the girls too often being far away, working a full time job and going to school in the evening. At dim sum, we met my mom and Eric’s fiance Cynthia. 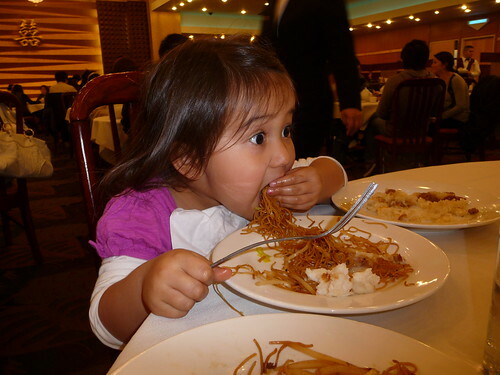 Ava could not get enough of the fried noodles. Look at her. She is IN TO IT. The chicken feet on the other hand, not so much. 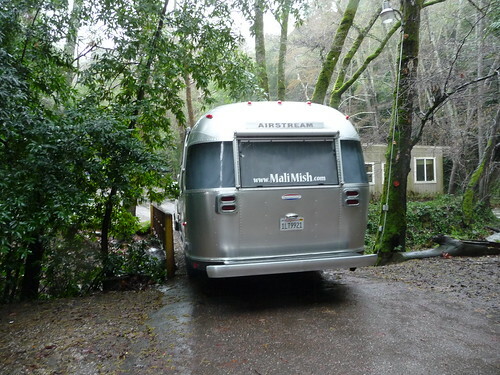 Back at the secret parking spot, there sits a beautifully little 16 foot Airstream International Ocean Breeze. Apparently this is where she lives all the time. The owner works at the building that this parking lot belongs to and probably uses it to take mid afternoon naps. Not a bad idea. Silicon Valley is a busy place. 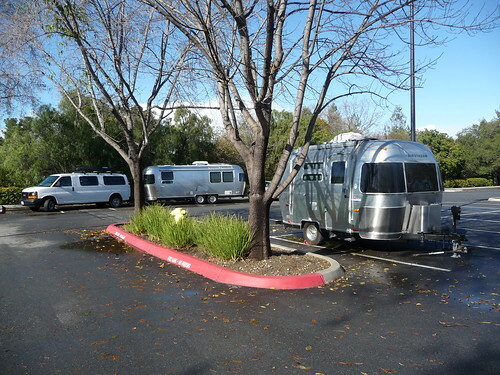 Just as many metropolitan areas, it does not have many, if at all, in town RV facilities. We did some researches ahead of time and found that just a few miles outside, there is a campground called Saratoga Springs. Saratoga Springs is just a few miles down a 2-lane windy road outside of the town of Saratoga, CA, which is on the southwest edge of Silicon Valley. Just as you drive down the 2-lane road, giant redwood trees seem to sprout out from no where and pretty soon you feel like you are no longer in the heart of the world’s technology hot bed but rather a redwood forest in Oregon. Saratoga Springs is not your typical RV resort. 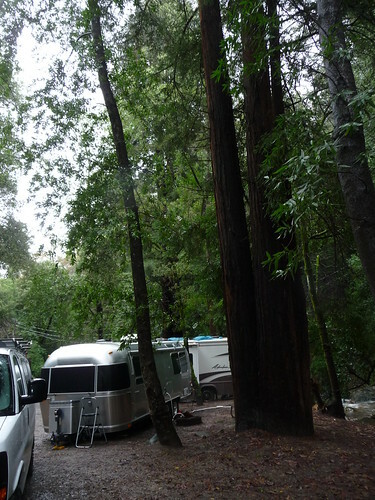 It does not have stall after stall of RV sites but rather just spaces in between trees where you can fit trailers in. 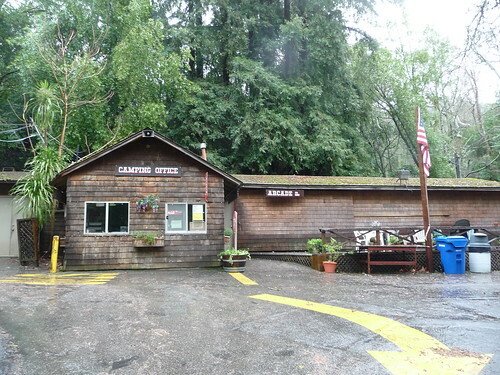 It has the feel of a boon docking locale with narrow roads and giant redwood canopies surrounding you in all directions. 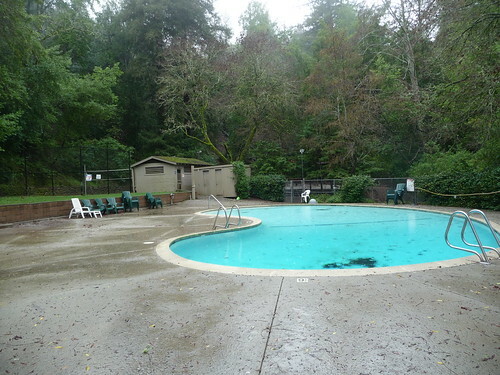 Right through the middle of the campground there is a fast running creek dividing the resort into multiple areas. It is normally not running this fast but since we just had a week’s worth of rain, it was as full as it has been in years. 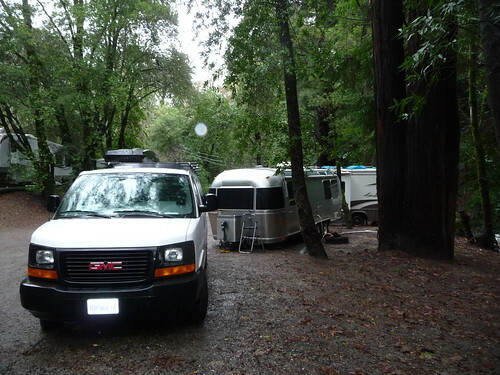 Our spot was right next to the creek in between a couple of giant redwood trees. 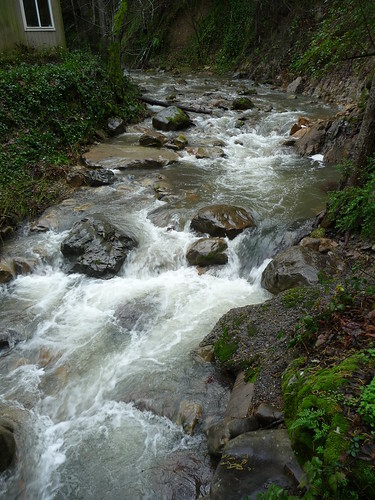 It was very soothing to hear the water running past us as we sleep in the trailer at night. Marlene was not comfortable at all with the slope of the dirt pad we had to set up on. She was convinced that we would eventually slip into the creek. Well, as you can tell by now, we made it back. 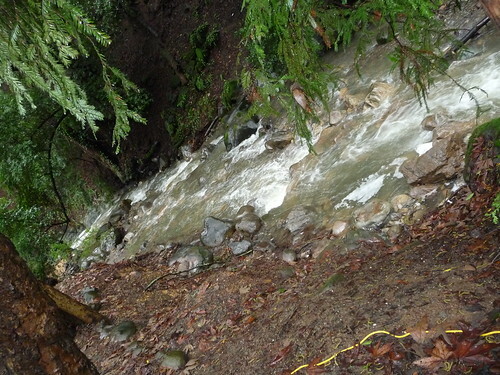 This is what the creek looks like just a few feet outside of our Airstream. 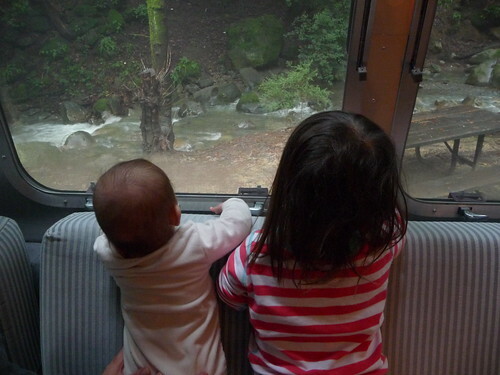 Ava and Mila also admired the creek from inside the Mali Mish. What?! There’s not a hand holding Mila up to the window? What are you talking about? 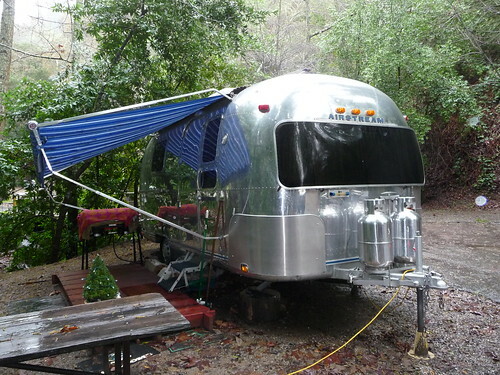 A couple spaces up from us was this vintage, polished Airstream. We didn’t see anyone staying in it the whole time or we would have introduced ourselves to get a tour of it. However it looks like it might be a semi-permanent fixture at Saratoga Springs with a redwood deck built just out side of its steps. It made us feel more welcome to see such a familiar profile in such close proximity. 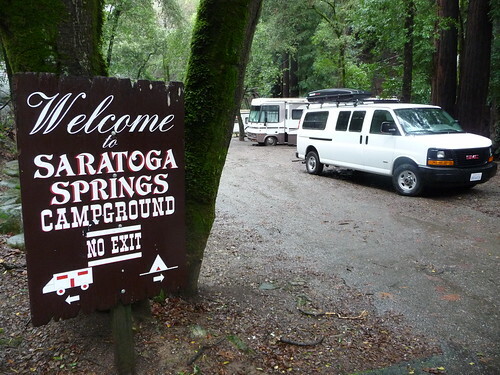 Saratoga Springs is a privately owned campground. A camp site with electricity and water runs $32 a night. There is no sewage hookup in any of the sites but they do offer a pump out service for $10 a pop. The gates close promptly each evening at 5:00pm and only registered campers can get in and out with a remote controlled gate opener. Unluckily for us, the host forgot to give us one. Each of the 3 nights we stayed there we had to wait at the gate for someone to come by in order to get back in. By the time we learned that we were suppose to get the opener from him, it was already the third and last night of our stay there. 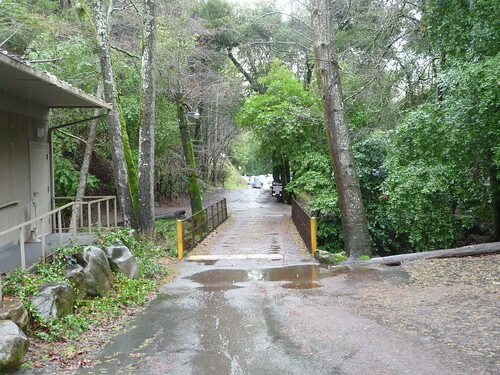 Getting to and from our site, we had to cross the creek over this narrow bridge. It gives you a generous 10 inches of buffer on each side as you cross the bridge. Piece of cake. Now lets hope it is strong enough to hold us up. In the summer time, Saratoga Springs hold kids summer camps of various types. Since it rained again for a couple days straight after we got there, we couldn’t really do too much wandering around the campground. I did a couple of quick strolls to see what was all there and it sure looks like a fun place to be when it is warmer and drier. 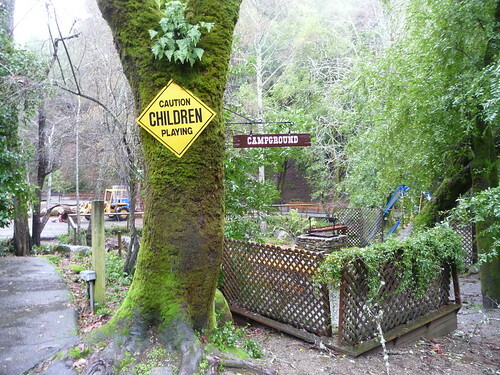 Here are just a few more photos of the campground for your viewing pleasure. 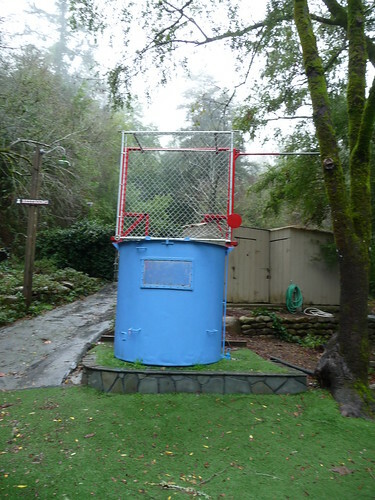 That’s right, it’s a dunk tank. We packed up and left Saratoga Springs and said good bye to my family after 4 nights and 5 days in the Bay area. With a couple more items added to the to-do list, we have only a few more days before we head out for the greatest trip of our lives. And we’re off… Road Trip 2010!! !